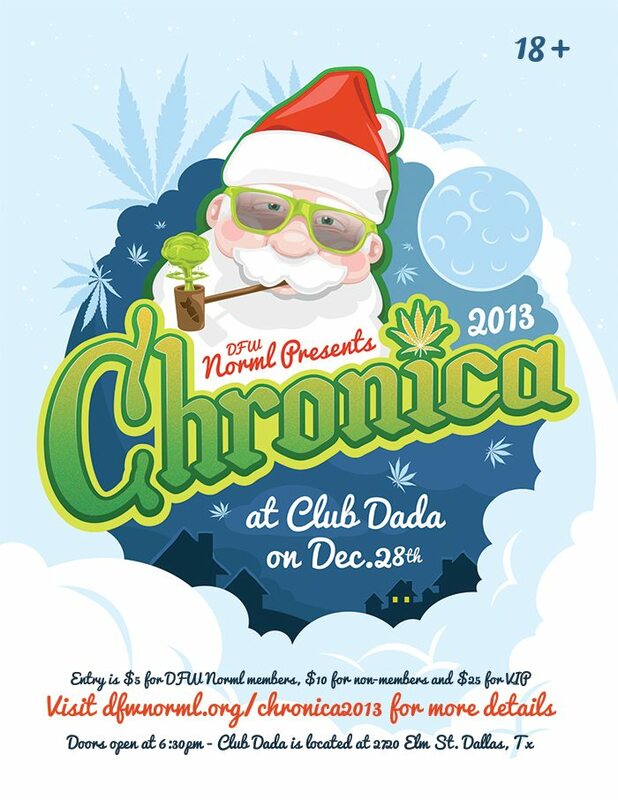 You are cordially invited to partake in #Chronica2013, the second annual holiday party for DFW Norml. Last year our holiday party brought out 400 Texans and this year we’re doing things even bigger! Join us on Saturday December 28th at Club Dada as we celebrate the conclusion of another successful year for our organization with live glass blowing and art demonstrations, raffle prizes, drink specials, music and more. All tickets available at the door only. 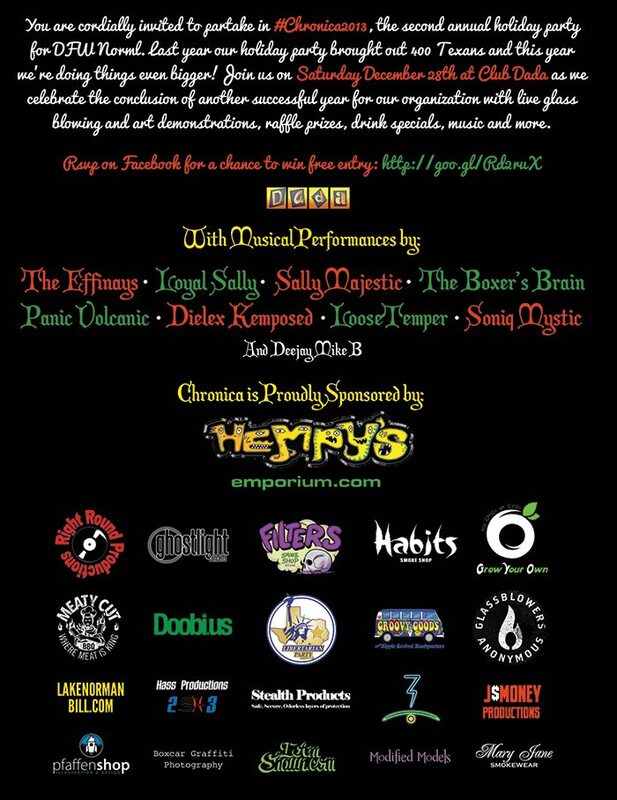 Doors open at 6:30pm, directly following the conclusion of DFW NORML’s December meeting, also at Club Dada. General Admission – The first 50 people in the door will receive a free General Admission wristband, good for the main stage area and outdoor area only. Current members of DFW NORML pay $5 for General Admission and non-members pay $10. This wristband does not include access to the VIP area. Not sure if your membership will still be current by 12/30? Email loretta@dfwnorml.org to find out. VIP Admission – For the first time at a DFW NORML event, we will be offering a VIP wristband for $25, which gets you access to both the General Admission and VIP areas of the event. You’ll also receive one free plate of food from Meaty Cut BBQ with your VIP wristband and the first 50 VIP wristbands sold also include a limited edition swag bag! For an additional $5 (or $30 total) you can add a 1 year DFW NORML membership to your VIP wristband, saving yourself $10 off our new membership cost. 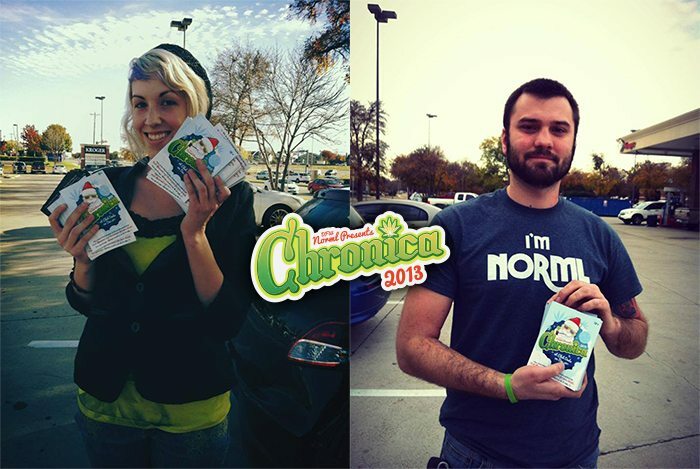 RSVP and invite your buds today for a chance at a free one year membership to DFW NORML and free entry to #chronica2013 for you and a friend. Do you support DFW NORML’s goal to end marijuana prohibition in Texas? Then email shaun [at] dfwnorml [dot] org for information about getting your logo on our event flyer, printed advertisement, web ads and other event-related goodies.